Tom Schwab’s first job after college was in the Navy, running nuclear power plants. He’s run a nuclear reactor and a small business. One was easy because it came with an instruction manual. In 2008, Tom’s company was one of the early e-commerce companies using Inbound Marketing content to attract, engage and delight customers. By blogging, they grew from a regional player to a national leader in under 36 months and became one of HubSpot’s early case studies. After selling the company and try to help others do the same, they realized that blogs no longer work like they did. While every tactic has an expiration date, the strategy still works. Blogs were dying, but podcasts were taking off in 2014. They hypothesized that podcast interviews could be used much like guest blogs: Tap into a large existing audience, share in the authority of the host, gain the “know, like, and trust”, then move their audience to become your visitors, leads, and customers. Marketing at its core is starting a conversation with someone who could be an ideal customer. Tom helps authors, speakers, coaches, and brands get featured on leading podcasts their prospects are already listening to. Then he shows them how to turn listeners into customers. Also an author, Tom wrote, CONNECT: Grow Your Business as a Podcast Guest. He also created the CONNECT Online Course and is founder of Interview Valet, the concierge level podcast interview marketing agency. Tom lives online but resides with his family in Kalamazoo, MI. 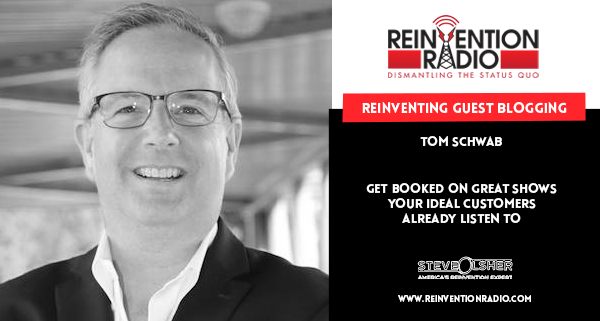 Tune in to hear Tom chat with Steve, Mary and Richard about getting listeners that resonate with what you have to offer to visit your site and getting booked on great shows that your ideal customers already listen to. Can you use podcasts the same as a blog? How do we get booked on shows? Reinventing Working At Home – In this episode, tune in to hear Caitlin Pyle chat with Steve, Mary and Richard about her journey from unemployment to becoming a millionaire.